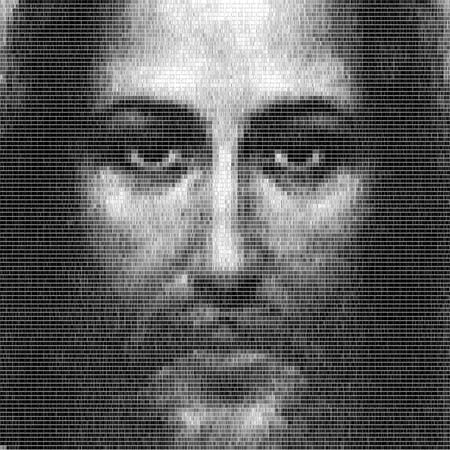 20th century prophet and clairvoyant Saint Slava Sevrukova saw Jesus Christ in a religious time travel vision and claimed that his facial features were mesmerizingly symmetrical. Image Source: The New Oxonian. Welcome to a new installment in this year's Hallowe'en Countdown! 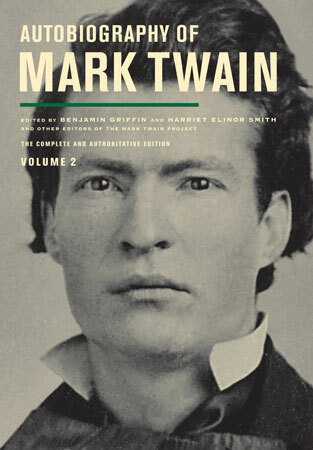 Today, I follow up on this post about Mark Twain's speculation that Satan was a metaphor for our dream selves - a manifestation of our deepest, most unruly instincts. Today's post is about the hidden sides of ourselves which lie in plain sight, quietly expressed through body language, posture, a nervous tic. Good tailors and seamstresses know that people's whole bodies are asymmetrical, and part of the artistry of their craft lies in making clothes which make a body appear balanced, when it really isn't. Gwyneth Paltrow has highly unusual facial symmetry. Her regular appearance (center); her right side is mirrored on itself in the far left photo; her left side is mirrored on itself in the far right photo. Princess Diana also had a very symmetrical face (see here). Image Source: right reading. The same goes for faces. Very few people have nearly perfectly symmetrical faces. Facial asymmetry is a feature known to artists, photographers and hairstylists. Half their battle is finding the flattering angle in an imperfect subject. You can see a professional photographer discussing how she lights her own face to make it look balanced, 'normal' and beautiful, here. But there are even deeper dimensions to the implicit metaphysical messages our unbalanced faces give. With every crooked smile, we supposedly betray the ghosts which lurk within us. Mistaken for the remains of early Christian martyrs, the relics, known as the Catacomb Saints, became shrines reminding of the spiritual treasures of the afterlife. They were also symbols of the Catholic Church's newly found strength in previously Protestant areas. 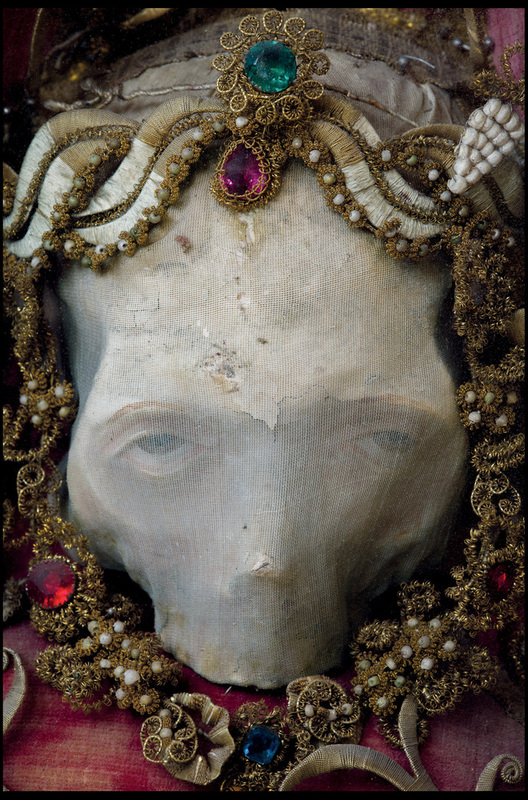 "The skeletons would then be dressed and decorated in jewels, gold and silver, mostly by nuns. They had to be handled by those who had taken a sacred vow to the church - these were believed to be martyrs and they couldn't have just anyone handling them. They were made saints in the municipalities. One of the reasons they were so important was not for their spiritual merit, which was pretty dubious, but for their social importance. They were thought to be miraculous and really solidified people's bond with a town. This reaffirmed the prestige of the town itself. ... Tracking down the remaining skeletons involved lots of detective work, and for all the ones that are on display there are a lot that aren't. Some were in churches but others were hidden away in storage containers and lock-ups. I'm positive there are some out there that are yet to be discovered. I'm of the opinion these are the finest works of art in human bone ever made." You can see Dr. Koudounaris's Website here; he has explored ossuaries, catacombs and charnel houses across Europe and published another book on the subject, The Empire of Death (2011). See my earlier post on creepy ossuary decor here. See more images below the jump. All images are taken from a HuffPo report, unless otherwise watermarked from Dr. Koudounaris's site; all images are © Paul Koudounaris and reproduced under Fair Use for non-commercial discussion and review. St. Michael Vanquishing Satan (1518) by Raphael. Image Source: Dark Dorset. Today is Michaelmas, the day devoted to the Archangel Michael, chief of the angels, who threw Satan out of heaven. 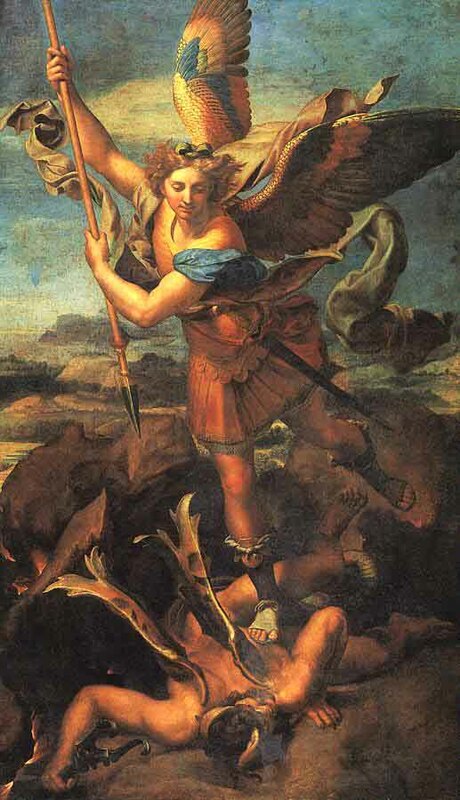 St. Michael is also an eschatological figure, who is supposed to play a prominent role in the end times. See a great discussion of the significance and old customs of the day in Britain, at Dark Dorset, including cooking a goose at dinner. There's a touch of ancient sacrifice to this festival: "'September, when by custom (right divine) Geese are ordained to bleed at Michael's shrine.'" Michaelmas also marks the last day of the year for eating blackberries (which explains why an Italian friend put a picture of Bavarese alle more up on Facebook yesterday). Satan, according to religious legend, landed in a blackberry bush when he fell to earth, and cursed the berries after September 29. September 29 is supposed to be the last day of the year to eat blackberries: Macarons alle more. Image Source: Cucinare Dolce. Michaelmas celebrates St Michael and all angels, which falls on 29 September for most of the UK. There are anomalies though: It's 4 October in Suffolk, and 11 October in Norfolk. It falls near the autumn equinox and also marks a medieval festival when harvest was finished and farmers paid rent to the landowners, often offering geese as part of the exchange. Goose fairs became popular across the country, with farmers driving their geese for miles to get to market. The Michaelmas goose itself became associated with paying off debts, and according to folklore eating one on the day would bring financial luck for the coming year. But over the last century "the seasons' festivals we used to have, fell out of fashion", says food writer Karen Burns-Booth, who specialises in food history and traditional recipes. Michaelmas geese tend to be leaner than their Christmas cousins, because they are slaughtered earlier and have been fed on "lovely lush spring grass", while Christmas geese fatten up during the winter, explains Mr Hegarty [chairman of the British Goose Producers]. A traditional Michaelmas goose can be roasted and served in the same way as a Christmas goose, but a number of recipes instead use seasonal ingredients such as apples and blackberries, or marrow and runner beans.